Figure 3.3: If you look in a soil pit or on a roadside cut, you will see various layers in the soil. These layers are called soil horizons. 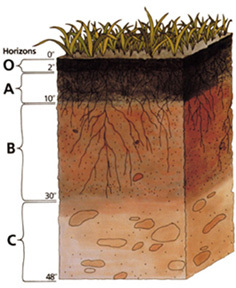 The arrangement of these horizons in a soil is known as a soil profile. In order to explore what is living in the soil, we will collect and analyze soil profiles from our field sites, describing physical characteristics of the soil and the microbial and insect communities living there. We will then compare our results with other soil profiles compiled from online sources. We will also compare our results with the results of previously collected profiles for six distinct Montana environments: forest, river-wetland, grassland, sage, urban, and compost sites. Soil profiles for many different environments can be viewed at the Natural Resources Conservation Service Soil Profile Gallery. Check Your Thinking: What can the results of a soil profile be used for?